India is a country which has a population of 1.3 billion and has been crazy for only one sport (cricket) for many decades. All my friends back in India used to play cricket, but I always loved playing football. I started playing when I was 12 years old and did not miss a single day when I could play. Even if we were 6 players, we played 3v3; if we did not have a ground, we played on the streets; even if I was alone, I just needed a football. At that time there was no professionalism in football in India and we had to focus on our studies as sports was not a part of the curriculum, which has now changed. I played many other sports like table tennis, roller hockey, volleyball, I loved skating and swimming, but I could never compare how passionate I have been for football. I did my graduation in Bachelors of Computer Applications and worked in the Information Technology Industry for almost 4 years, and in those years I realised how fast the Football Industry is growing all over the world. In India, the popularity among the youth is more towards football rather than cricket but it lacked professionalism and creativity which led me to do some research. That’s when I found out about The Football Business Academy (The FBA) which was very interesting for someone like me who is passionate about football and is looking to make a difference but has no experience in the respective industry. 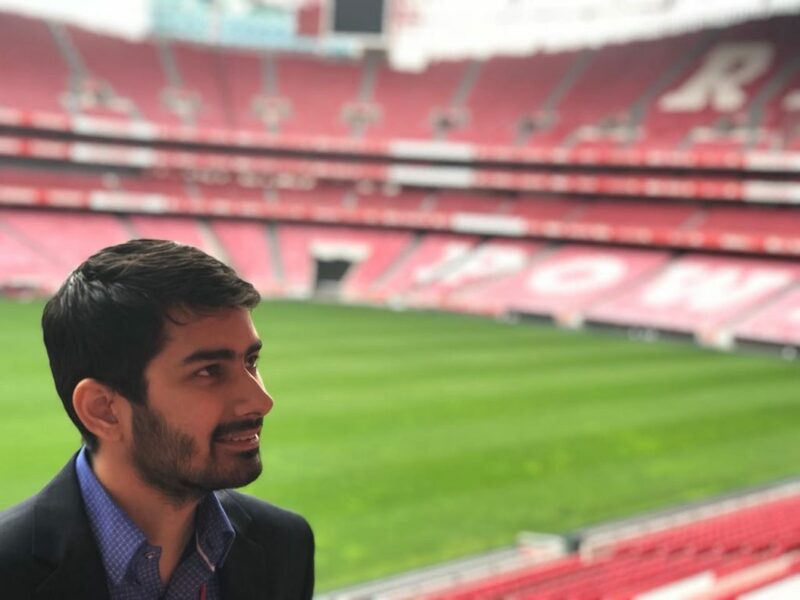 For an Indian, it is taking a big leap to get into this industry, but I did not think twice as I was following my passion, so I applied and the next thing I know I was in Manchester visiting Old Trafford and starting with the 1-year program with The FBA. That is when I started to learn the business side of the industry. I left my job and everything else behind and focused on learning and getting to know the industry. Meanwhile, India was going to host its first ever major football event, the FIFA U-17 World Cup 2017, and, because of The FBA, I had an opportunity to be part of the Marketing department and experience a great atmosphere! A major part of the course for me is the 3-month internship which helps us get the valuable experience and learning while working with key stakeholders and decision makers. I got the opportunity to work with one of the European Giants – Sport Lisboa e Benfica – in the Marketing department where in the first few weeks I got to meet everyone in the team, learn how everything works in various departments like Merchandising & Licensing, Soccer Schools, Events & Innovation, Branding etc.. and share my ideas on how Benfica can be involved in the Indian market. Getting the perspectives from the department directors and managers opened my mind to various other opportunities and that experience has been invaluable! When I first came to Benfica, I had a different perspective on how I can bring value to the club while helping Indian football develop, but working here has changed my thinking into a more strategic and business sense and because of that I have been able to get in touch with various key stakeholders, clubs, academies and sports agencies in India with different ideas on how they can be in partnership with Benfica while learning from their experience in the Indian market as well. Thanks to the FBA Family and Benfica, it has been the most exciting past 10 months for me and will always remain special. I believe that I have stepped into the Football Industry and with the knowledge & experience I’ve gained, this is just the start and I can’t wait for the new challenges coming ahead in life and just live my dream. Sport Lisboa e Benfica is a Portuguese football club based in Lisbon, and the most successful one in the country’s history. For more information visit their website.